I have seen some claims that Ada Lovelace was the first programmer. Is there any actual code to back this up? Ada Lovelace didn't write any code as such. This is largely because the Analytical Engine, being created by Charles Babbage was never finished and so no code could be run. 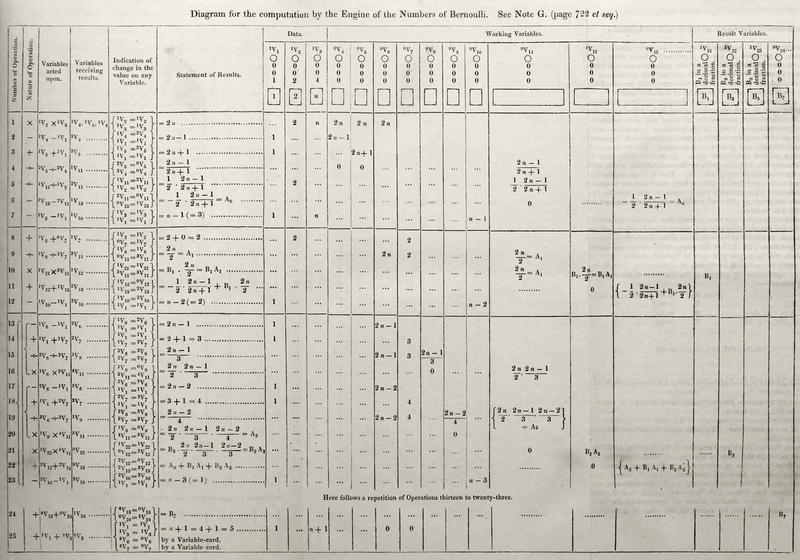 Babbage designed the Analytical Engine to be a much more capable machine than the Difference Engine and to be capable of operating a program from punched cards - which he called Operation Cards. Lovelace worked with Babbage to create a method of describing and encoding algorithms on these cards. Essentially she invented computer language and programming. She foresaw the uses to which these calculating devices could be put. However, none of her cards, if any were produced, have survived. This is not a direct answer to the question, but one of the best (and additionally entertaining) ways to learn more about Ada Lovelace, Babbage and the Analytical Machine is a graphical novel called The Thrilling Adventures of Lovelace and Babbage. It contains a ton of information (including original letters and graphics) in it's footnotes and appendices. It also explains the the programming model behind the Analytical Machine. Not the answer you're looking for? Browse other questions tagged software history or ask your own question.